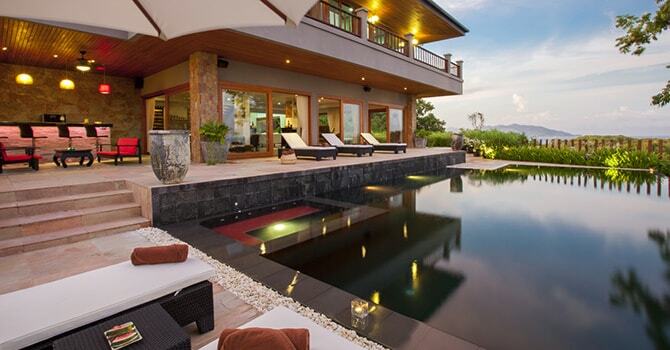 Luxury 4 bedroom sea view villa with open air kitchen & dining beside the private pool in Bophut. 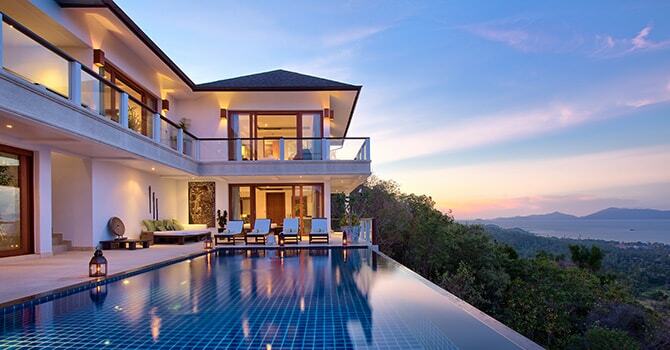 Elegant 3 bedroom private villa in Bophut, with panoramic views, oversize infinity pool, and plush designer furnishings. A 4 bedroom oasis with direct beach access in beautiful Bophut, this luxury villa boasts an oversized infinity pool and panoramic views. If you're looking for a heavy dose of traditional charm alongside stunning beaches and ocean views, you're sure to love beautiful Bophut in Koh Samui. 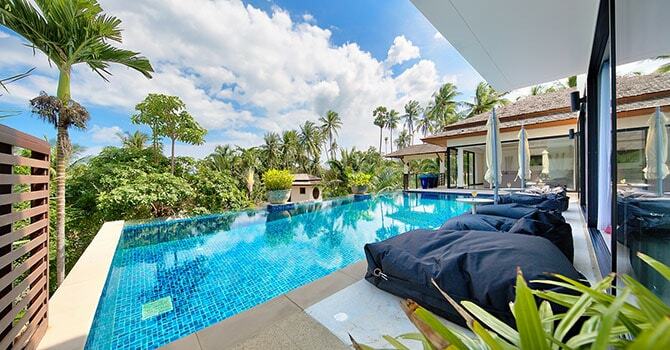 With bucketloads of historic charm as well as modern amenities, it's no wonder it is such a popular location for holidaymakers who love staying in the beautiful villas in Bophut. 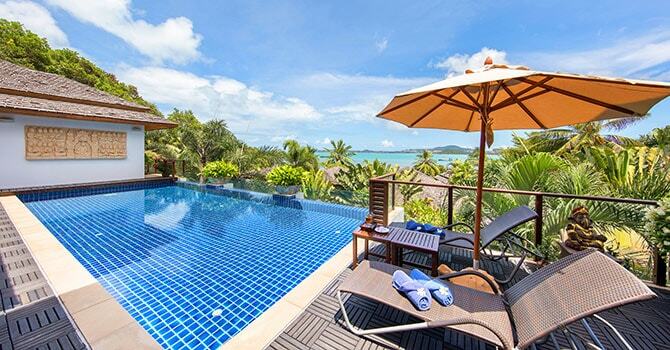 Bophut Beach is located in northern Koh Samui, between the Big Buddha and Maenam beaches. 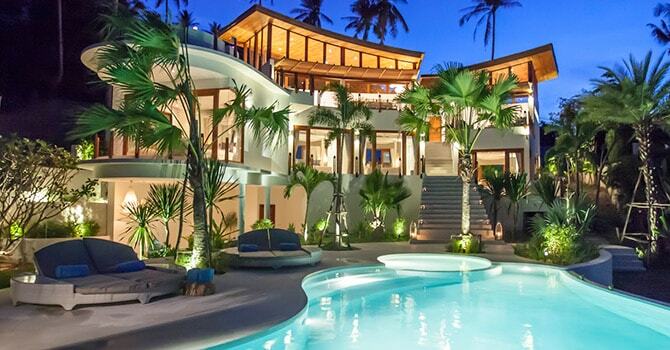 It takes just fifteen minutes to arrive from the airport so you can expect to be in your villa soon after landing. Upon arrival visitors are sure to love the kilometers of stunning white sand, with clear blue ocean that is perfect for splashing about in. Bophut is the third most popular place to stay in Koh Samui, and perhaps another reason for this is the gorgeous fishermen's village which is located a short walk from the beachfront. This picturesque place has much charm of yesteryear, now with a number of shops, restaurants and bars. The best swimming can be found toward at the western end of the beach, where the water is calm and tranquil. As well as swimming, snorkelling is also popular and divers may like to join in a trip out into the deeper waters of the Gulf of Thailand. Bophut has been influenced by both Thai and Chinese culture, and one of the results of this is that it offers some of the most delicious food to be found. There are many excellent local restaurants, and you can also find other cuisines including French, Indian, British and Australian. Seafood is a popular choice owing to Bophut's reputation as a quaint fishing village. Many of the eateries look out over the sea, which is a wonderful way to enjoy a delicious meal. If you stay in one of Bophut’s villas, you will be able to request your chef to prepare a meal with fresh fish bought from the market. Another popular past-time in Bophut is shopping. There are a number of friendly and laidback shopping opportunities, including most famously on Fridays when nearly all of the village becomes a bustling market, especially towards Fisherman's Village Walking Street. All through the week, the Wharf is also a good place to shop for souvenirs. Being Koh Samui's third largest resort town, Bophut offers some excellent nightlife to enjoy. Many of the best bars and beach clubs, such as Coco Tams, are located right on the beachfront, leading to a stylish and elegant atmosphere. Unlike busier areas, the nightlife in Bophut is more relaxed and many venues are suitable for children to visit and perhaps enjoy a mocktail! There is no shortage of fun activities to enjoy as you stay in Bophut, whether you're travelling as a couple, family or group of friends. Samui Go-Kart is located here, and is a great way to get your adrenaline fix and bring a smile to your face. Just beware, the 500-metre long track seems to bring out the competitive spirit in everybody! Perhaps the most famous attraction near Bophut is Big Buddha. The huge 12 metre gold Buddha is actually located on a small island, but accessed via a causeway. It's highly recommended to visit during your stay in the area. Another activity you cannot miss while in Bophut is indulging in a luxurious and rejuvenating massage. There are many spas where you can enjoy treatments including facials, massages and manicures. With so much to do, see and enjoy in this charming and laidback historic area, it's no wonder that Bophut is such a favourite amongst those in the know. Certainly, with so much charm, there's something for everyone in beautiful Bophut. If Bophut sounds like the kind of place you'd love to be, why not start looking and planning out your dream activities? Hopefully, those dreams will soon be a reality!